Most people make what they consider their most flattering expression when a photo is being taken. Do you find yourself maneuvering your mouth into poses that don’t reveal your teeth in pictures? If so, it’s time to figure out how you can smile for every photo without worrying about your unsightly teeth being the focal point. 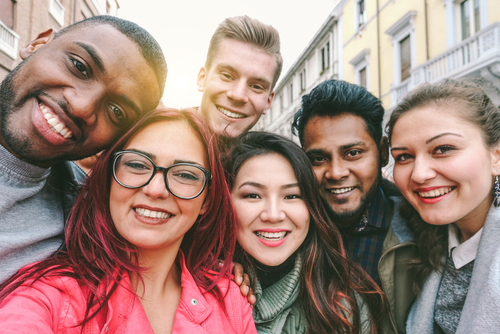 Get on track to a smile makeover that will stand out in group photos for all the right reasons. If you’re ready for an all-encompassing smile makeover, there are many cosmetic dentistry procedures than can transform your appearance. Even if you’re only ready for small tweaks, there are procedures that can make all the difference in how your smile looks in a photo (and in real life). Teeth whitening: One of the most affordable and fastest smile makeover procedures, teeth whitening upgrades your smile in about an hour, giving you bright, white, beautiful teeth. Porcelain veneers: The king of smile makeover procedures, veneers conceal every cosmetic complaint you have and some you didn’t even know you had. Cosmetic tooth bonding: Quick and non-invasive, cosmetic tooth bonding repairs that damaged, chipped, jagged, or discolored tooth once and for all. Dental implants: If you’re missing even one tooth, the hole in your smile affects your appearance and the function of your teeth but dental implants give it all back. All of these aesthetic changes elevate your smile so you look better, happier, healthier, and even smarter. If you want to stand out in a group photo at work, these smile makeover choices will get you the pearly whites that often accompany success. Reading about the benefits of cosmetic dentistry and restorative dentistry is important and persuasive but, for some people, a visual is necessary too. Seeing how someone else’s teeth have been transformed by your Manhattan cosmetic dentist is powerful. Even more impactful, however, is getting a look at how your own teeth and face will look after treatment. Digital smile design software has the capability to show you your smile makeover before you hit the green light on any procedures. You can see yourself with your porcelain veneers, crowns, dental implants, or otherwise. Getting a look at your smile results with a digital preview is incredibly exciting and lets you see the possibilities for the future you. Whatever kind of photos you’re in – group pics, selfies, or otherwise – you want to look your best. Even if you’re known for mugging for the camera, it helps to have good teeth being frozen in time. Smile makeovers are personalized to every patient, so whatever issues you have with your teeth, there is a solution. Rebuild your smile from the ground up or beautify what’s already there. Anything is possible with help from Dr. Michael J. Wei. Schedule an appointment at his Midtown Manhattan dental office on Madison Avenue to talk teeth.